What a great event! The season finale was also the Don Brown Memorial (ALS) Tournament. We had 19 boats fish the club tournament and 36 boats fished the whole event. The weather turned out great, considering we are still recovering from Hurricane Irma on Tuesday. Clear skies prevailed with a starting air temp of 60 and we finished around 80 degrees. Water temps were steady from 73-75 degrees. Wind was 0-5 NNW. 1st Place and Big Fish went to Team Chaser with 72.5″ The Big Fish was 37″. Bob and Charles got some early pulling boards and free lines in 30′ of water. Still fishing Mud Creek. They switched to downlines at 9:00AM. Bigger fish came off gizzard shad 40 to 60′ down over 60-100′ deep. Striper Sniper had 2nd Place with 65.5″. 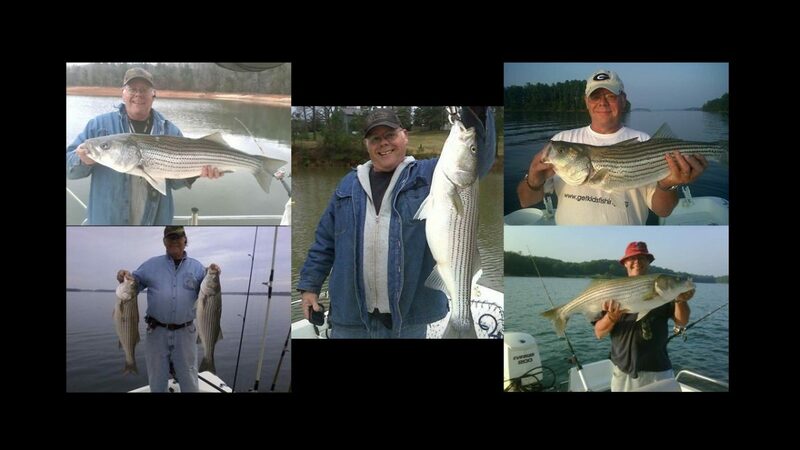 David and Jeff had similar success fishing boards and freelines with shad in the morning. The downlines came out with the sun. They boated over 20 fish for the day. Team Simpson/Castillo/Honcho/Head Honcho had 3rd with 57″. Call them what you want, but Leonel and Shawn got theirs up the river. 4th place went to Team Green with 55″ 5th went to Double Trouble with 54.25″. Main Arrow had 6th with 51.5″ Back in Black had 7th with 50.75″. Mike also had a solid walleye joining him for dinner. Lanier Striper had 8th with 50″. 9th place went to Backwoods with 49. Bucktales also had 49 ” for 10th place. Abercrombie & Fish had 11th with 48.25″. Nauti by Nature had 47″, good for 12th place. The pattern for numbers were downline herring over 60-120′ bottoms. Fish were in the main river channel at the mouth of creeks by late morning. They started out in mid creek pockets from 30-50′ deep. We all had a lot of shopping and pull downs. So we all went through a lot of bait. Fish were caught by trolling leadcore, spooning, freelines, downlines and even topwater. Fish were caught in the mouth of Baldridge, Dam, Saddle Dyke, Shoal Creek, Big Creek, Flowery, Orr and Mud to name a few. Of the 19 boats we had 15 catch 2 or more. Only 1 boat skunked. All in all, a great day. A great way to end the season. Most importantly, the Open Tournament generated over $3000 for ALS in the name of Don Brown. Thanks again for all of you that helped at the event. A very special thanks to Lynn Gregory who couldn’t make the event do to her injury. Her hard work paid off, making the event run smoothly. The only suggestion I have is that we schedule the tournament on a non racing weekend. I had some racers that wanted to fish, and they couldn’t because it was the last points race of the year and they had to race. I could probably get a few more boats involved if we could look at the Atlanta Dragway schedule in January before scheduling this tournament next year. Great tournament for a great cause! Thanks to all who have made this possible in the past 2 years and all who will make it possible in the future. My Dad loved the lake and fishing and the Striper clubs he belonged to. ALS is a horrible disease that has no cure, no treatment and no hope once diagnosed. I hope that we will all be able to continue to raise money for the ALS association so that they can continue to research this disease and hopefully find anything that will help people in the future who are diagnosed with this.